One of Brazil’s most famous beach and party destinations, the island city of Florianopolis is known for its eclectic, vibrant nightlife and its breathtaking beaches. Located in the heart of the country’s “Silicon Valley,” this floating metropolis is known as the gathering point for “techies,” surfers, and merry-makers. Every day after work, crowds flock to the beaches. Although Florianopolis has become a vibrant town with over 400,000 residents and a provincial economic center, the city has managed to maintain its charming, laid-back atmosphere, making it the ideal spot to spend a few days relaxing and soaking up the sun. The island is connected to mainland Brazil via 2 picturesque bridges, one of which, though no longer in order, beautifully defines the skyline when lighting up at night. A Brazil For Less representative will meet you at the airport in Florianopolis and take you to your confirmed Florianopolis hotel. You’re free to spend the remainder of the day at your leisure or exploring the city solo. Check out our selection of excellent Florianopolis hotels. Today you’ll enjoy a half-day tour of Florianopolis and see the main attractions of the city. Meet your guide at your hotel and head out to the Metropolitan Cathedral where you’ll see an impressive wooden sculpture dating back to the 17th century. During the tour, you’ll also visit the Governor’s Palace, which is home to the city’s Historic Museum; the Monument for the Dead in the war between Brazil and Paraguay; the XV de Novembro square with its 100-year-old fig tree; and the lively market. Finally, you’ll ascend the Morro da Cruz, a vantage point in Florianopolis where you’ll enjoy breathtaking panoramic views of the city. After the tour, you’ll return to your hotel in Florianopolis and have the evening free to spend at your leisure. Spend the day as you wish in beautiful Florianopolis. You can check out the beach and relax, or browse our additional Florianopolis tours for suggestions on how to spend the day. After breakfast at your hotel, meet your transfer to the airport for your journey home or on to your next destination. Browse our full range of Brazil travel destinations for additional vacation ideas. Enjoy a full-day boat tour of the Florianopolis area. You’ll embark on a schooner and sail under the Hercilio Luz Bridge, and continue on to enjoy spectacular views of the North Bay until you reach a passage through the Ratone Islands. You will stop on Anhatomirim Island to visit an 18th century fortress then visit the Dolphin Bay where you might be able to catch a glimpse of the friendly animals. 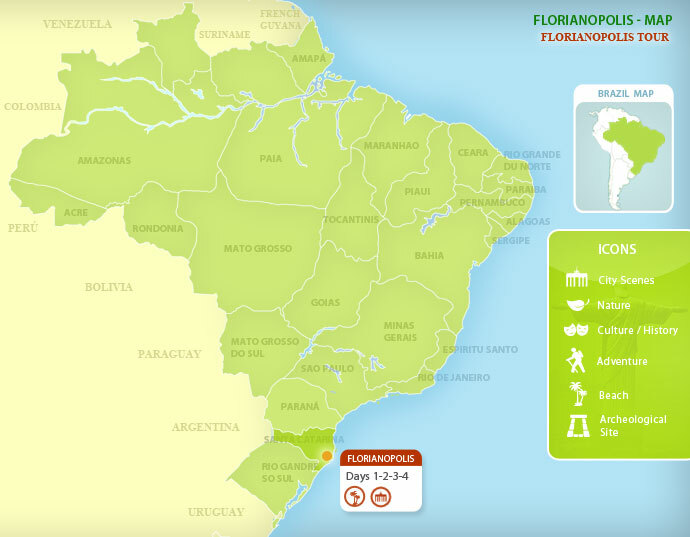 After the tour, you’ll return to your Florianopolis hotel.